Onam is coming up next week and without a ona sadya, the celebrations are not complete. 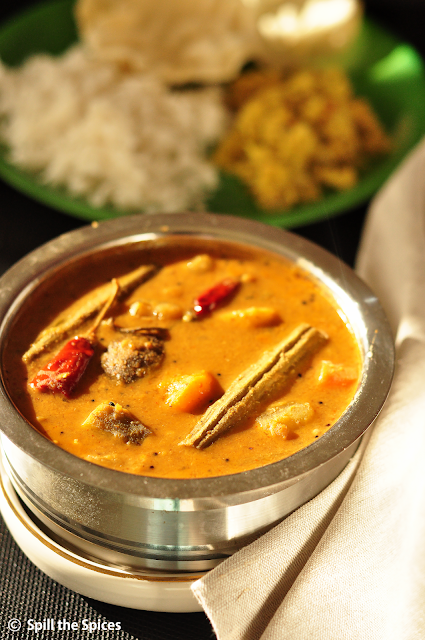 Now there are several items in a sadya that are mandatory and sambar is one of them. Once we get a little taste of the payasam and have a small fistful of rice mixed with parippu (lentils) and ghee, the real feast starts with the sambar, followed by rasam, payasam and ending with curd rice. There are couple of sambar recipes in the blog using sambar powder and freshly ground sambar masala. The recipe I'm sharing today is a typical Kerala style sambar - more like Thrissur side - with freshly ground spices and roasted coconut. Usually when we make arachuvitta (ground spices and coconut) sambar, we do not roast the sambar. 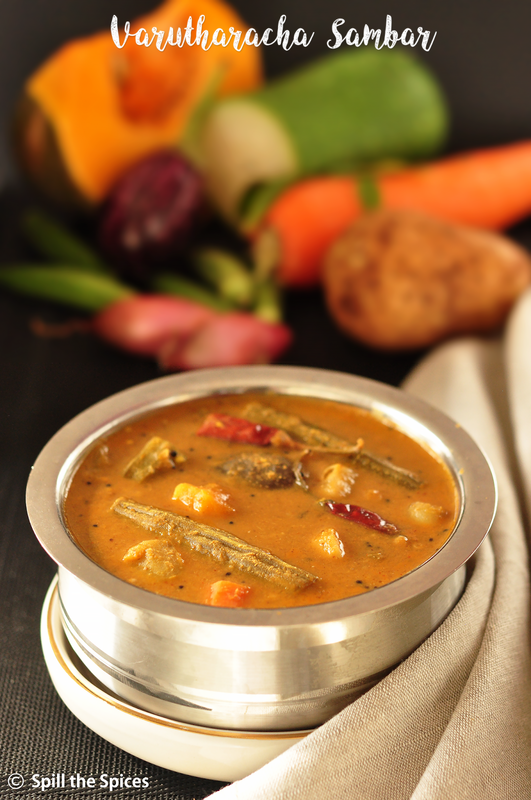 Slow roasting the spices and coconut makes this sambar taste divine and fills the whole house with a wonderful aroma. I have added different vegetables in small quanties. You can add whatever you have in hand but don't skip small onions/shallots, drumstick and pumpkin. Serve with any thoran or mezhukkupuratti. Check out other ona sadya recipes here. 1. Pressure cook the toor dal with turmeric powder and 1 1/2 cup water for 3 whistles. Mash the dal and keep aside. 2. Soak the tamarind in 1/2 cup hot water and extract the pulp. 3. Pressure cook the vegetables except small onions, lady's finger and brinjal for 1 whistle or until cooked. 4. Heat oil and add all the ingredients for the masala and fry in low flame till the spices are slightly roasted and coconut has turned light golden. Cool and grind to a smooth paste adding little water. 5. Heat a large pot and add coconut oil. Add the shallots, lady's finger, brinjal and fry for 3-4 minutes. Then add the tamarind extract, salt and cook till the raw smell goes. 6. Add the remaining cooked vegetables, ground coconut-spice paste, mashed dal, salt and water as required. Mix well and bring to boil. Simmer for 5-6 minutes. 7. In a small pan, heat coconut oil, ghee and add mustard seeds, red chillies and curry leaves. Pour over the sambar. Cover with a lid for at least 20-30 minutes before serving.